anything else you've ever tried. Activate them now to become unstoppable. "Few times in a generation does someone come along with a way of looking at a question as old as, 'Why do so many people hold themselves back from the success they're capable of?' and come up with an answer that is at once so simple and yet so powerful." There is a war raging inside you. Your desires, your beliefs, and your drive PULL you toward your goals. Toward abundance. Toward inspiring achievements. Your mind PUSHES you back! More than a temporary roadblock, your mind actually PREVENTS you from reaching your dreams. No matter how badly you want to change — to improve who you are, what you own, and what you stand for — your mind simply won't allow it. How's that possible? Because your subconscious mind is STRONGER than your goals, beliefs, passion… and even your actions! But settle no more, because today there's a NEW simple way to put an end to this internal war. By learning this NEW way, John Ray Higdon from Ft. Myers, Florida, earned one year's income in just 44 days. Monee Kidd from Cleveland, Ohio, learned it and lost 20 pounds in just 60 days… WITHOUT stress or dieting. Sheila Valles with Mary Kay Inc., went from $5,000 to $75,000 in monthly sales in less than 160 days. And from Beaver Dam, Wisconsin, Mary Gronholz's daughter cured her chronic insomnia in just one day. To an outsider, these seem like amazing feats. Well, they are. But they are also pretty typical once you learn to end this war between yourself and your mind. As a Nightingale-Conant customer, you already know more about how to succeed than 99% of the planet. You know how to set goals. How to use the power of thought. How to take the right action to net the results you want. Everyone teaches how to become successful… but that knowledge is rarely enough to combat the unbending unconscious habits of your mind. I know that sounds a little strange. Even counterintuitive. That's only because the concepts I'm about to teach you have never before been unearthed in the world of personal development. They are as original as Earl Nightingale's discovery that you become what you think about. This IS what's next. In fact, many of my students ask me the same thing: "Why haven't I ever heard of this before?" In fact, it even took me by surprise when I originally discovered it back when my life was begging for something powerful and original. My name is Noah St. John. For most of my life, I considered myself the world's foremost overeducated underachiever. Believing that good grades would enable me to live a rich and rewarding life, I skipped eighth grade, graduated from high school at the top of my class, and received multiple scholarships. Then the underachieving part: After college, I found myself in a series of dead-end jobs, hating each one more than the last. Praise for Noah St. John and his system from the LEGENDS of personal development! "Noah's program represents one of the most significant breakthroughs in the study of success in DECADES. If you want to eliminate self-sabotage from your life FOREVER, you owe it to yourself to get his program." "Noah St. John… is discovering within ourselves what we should have known all along — we are truly powerful beings with unlimited potential. Noah will inspire you to achieve the greatness that lies inside you." "Noah comes from his heart and shows you how to awaken your own inner power through the magic of a question." - Dr. Joe Vitale, Author of The Missing Secret and star of "The Secret"
"Noah speaks the language we all want to understand: How to make the most of your life and career." "You'll never get your foot off the brake and find the success you dream of until you take Noah's advice to heart!" "What an incredible program! Noah's course can help anyone reach their goals faster." "I highly recommend Noah's work for anyone who wants to get more out of life. He can save you time, money, and years of your life." - John Assaraf, Founder of OneCoach and star of "The Secret"
"Noah has created a remarkable system that transcends positive thinking and other motivational techniques to help you achieve success. Using humor and down-to-earth language, he gives you a step-by-step approach to help you create the life you want and deserve." Author of Men Are from Mars, Women Are from Venus and star of "The Secret"
Author of Conversations with God and star of "The Secret"
"Noah will help you reach your dreams faster, easier, and with less effort than you ever imagined possible. He's amazing!" At age 40, after suffering through an abusive relationship and saddled with $40,000 in debt, I found myself living (or just getting by) in the basement of my parents' home. Um, this wasn't the life I had pictured for myself. You see, like you, I had spent years reading and listening to all of the self-growth gurus. I memorized sessions. I could recite quotes. I knew this stuff forwards and backwards. I knew everything there was to know about how to succeed. Except actually doing it. Then quite by accident, I finally discovered the secret — the answer that changed my entire life. I realized how to ALLOW myself to succeed. As much as I wanted to reach my goals and fulfill my destiny — my conscious desire — I was also unconsciously engaging in habits that were preventing me from succeeding. In essence, I was trying to reach my destination of a better life by driving with one foot on the gas and one foot on the brake. Sputtering and crawling with my foot on the brake of living, it was no wonder I was under my parents' roof, drowning in debt, and questioning my future. That's when I discovered the very solution that would take my foot off the brake FOREVER — The Power Habits. Not only did these remarkably effective and simple Power Habits change MY life… they've given thousands of people around the world the answers in THEIR own search for abundance, fulfillment, and happiness! and RACE to the new life you want! I'll bet you have incredible goals for yourself: More free time to spend with your family. A career that makes you look forward to Mondays. Mutually satisfying relationships, less stress, and of course more money to enjoy the good things in life. Yes, it's possible you'll reach some of them using the old, traditional way of learning HOW TO succeed. But if you do, you'll no doubt crawl there. Because as much as you want and desire change, you are engaged in destructive habits that you aren't even aware of! Your conscious desire to change is your foot on the GAS. But your brain's desire to NOT change is your other foot on the BRAKE. What I discovered — and what has been proven by THOUSANDS of people who have turned around their businesses, relationships, and financial futures — is a proven way to permanently remove your foot from the brake! Remember, I hold the title of the world's most overeducated underachiever. So you had better believe I tried every personal achievement solution that existed. And the net result: Parents' basement. Dead-end relationships. Swimming in debt. Let's not relive it. Then I took my foot off the brake by creating The Power Habits — a fully integrated system that easily (and subconsciously) replaces all of your negative and destructive habits with positive and rewarding ones. Less than 12 months later, I became 100% debt-free, was blessed to meet the woman of my dreams, and landed a six-figure book deal with one of the world's largest publishers. Today, I'm the founder of the peak performance consulting company Success Clinic International, and I've appeared in more than two thousand media outlets, including CNN, ABC, NBC, NPR, Parade magazine and The Washington Post. I've witnessed first-hand, in thousands of cases, the remarkable results that happen when people and organizations apply the real-world, time-tested principles and strategies I'm going to teach to you. After learning and applying my Power Habits System, within four days, Brandon had received nine new client referrals — the most he had ever received! Then, in the first month of using my program, Brandon's sales tripled! By year's end, his personal income increased by 560%, and he was named agent of the year. What's more, in less than 40 days after learning the Power Habits, Brandon met the love of his life! REAL LIFE Power Habits Success Stories! "My business is on pace to DOUBLE this month. Prior to finding your program, I tried several home-based businesses, but my own limiting programming created a self-imposed barrier. "At this pace, I will develop a solid second income in the next few months. This is more than I accomplished with any other business in the last decade. Thank you Noah!" "…I closed a consulting contract for more than $110,000. I can now work 12 hours a week and make more money than I made last year working 70-hour weeks. Thank God I've been given Permission to Succeed – it feels great!" "I went from $5,000 to $75,000 in monthly sales in less than 160 days as a result of working with Noah. Thank you for taking the lid off my thinking and letting me know I could have the BEST!" - Sheila Valles, Mary Kay Inc.
"We've experienced a 300% increase in recruiting, and I have personally DOUBLED my personal production. Noah, thank you so much for changing my life and business!" "I'd spent over $30,000 on self-improvement products with few results. By following Noah's program, my sales tripled in one month – and by the end of the year, my sales increased 560% and I was named New Agent of the Year!" "I made over $500,000 from just ONE idea Noah gave me in 10 minutes. If you're serious about wanting to live the life you want, working with Noah is the best decision you'll ever make!" "My company went from $125,000 in sales to over $1.3 million in sales in just 15 months using Noah's program." "Using just ONE IDEA Noah taught me, I made an additional $29,000 in one week and an extra $22,000 in a DAY!" "I gained so much confidence in building my team, and my team sales and team volume doubled!" "Doubled my income in 90 days, then doubled it AGAIN!" "I feel as if I have a hidden weapon, a great secret. Although I keep telling everyone about them, so it shouldn't be much of a secret!" "I tripled my sales in just 30 days…"
"…out of the blue I was suddenly told I was getting an extra bonus! Thanks once again, Noah." One of my clients, Tim, was doing electric work in an elderly woman's home. He noticed that every 10 minutes, she went outside to smoke. After the fifth time, he asked her if she had ever thought of quitting. She nodded, "Every day for the last 20 years." She had tried patches, pills, hypnosis, everything. She wanted to quit, but her brain — her unconscious habit — wouldn't let her. Tim asked her to try once more. But instead of medicines or therapies, he would appeal to her mind using one of the Power Habits. He asked her to write one simple question on a piece of paper, put it on her refrigerator, and look at it just twice a day. She obliged. Several years ago, I attended a business conference where the admission price alone was $10,000. Yet, even at this high-level event, I was shocked by how many people told me they felt they were STILL holding themselves back from their full potential! I spoke with an entrepreneur of a $20 million company. He told me when he started to make it really big, he began to "sabotage" himself. He lost $175,000 in one weekend, simply because he didn't know how to let himself succeed. He said, "I could see it happening but still couldn't stop it!" This highly successful business owner finally said to me, "Too bad I didn't have your system back then, because if I had done what YOU teach, Noah, it would have saved me A LOT of money!" After I discovered the Power Habits System and turned my own life around, I realized it was my mission and responsibility to bring this teaching to those who were ready to move into a new life of true wealth, fulfillment, love, and joy. And who better to make that mission a reality than Nightingale-Conant, who has the most driven and dedicated followers. I haven't told many people this… but for 20 years now, my dream has been to be published by Nightingale-Conant. And now that dream has come true! It's my great honor to present my first Nightingale-Conant audio program The Power Habits System: The New Science for Making Success Automatic! Through this multimedia program consisting of 10 audio sessions on 7 CDs, a DVD of my recent webinar, and The Power Habits Action Guide, you'll learn how to easily change the one thing — your unconscious destructive habits — that will enable you to change your whole life. Your Relationships: You will meet, attract, and create deep bonding and mutual beneficial relationships with family, friends, and colleagues. Your Self-Confidence: You will gain a new sense of value and appreciation for who you are, leading to heightened levels of energy, genius, and creativity. Your self-esteem, self-worthiness, and self-reliance will be unmatched. Your Finances: You will create a far more abundant lifestyle for yourself and your family, while at the same time you will become more fulfilled through your career. Your Happiness: You will experience a renewed zest and enthusiasm for life. Plus, expect a sense of peace and fulfillment from knowing that you are living the life meant for you. Yes, I want to take my foot off the brake and automatically reach my goals. I can ORDER NOW and SAVE $20! These 12 Power Habits are simple to understand but require conscious effort to do. Beginning with Habit One, you will begin to move up what I call The Power Habits Pyramid. With each step, you replace your unproductive habits with productive Power Habits, so you are no longer holding yourself back from creating the abundant lifestyle you really want. Live by AfformationsTM: My first Power Habit is a revolutionary mind-framing tool used by thousands to attract more abundance and manifest desires. Reprogram your subconscious patterns from negative to positive simply by asking a question. Engage Your Loving Mirrors: Power Habit #2 hands you the tools to align yourself with the people who will be instrumental in advancing your career and personal success. Activate Your People System: Gain the five B.A.S.I.C. people habits of Power Habit #3, and watch how fast your friends, family, and colleagues are drawn to you. Install Your Activities System:Multiply your efforts and gain leverage in your personal and professional life with Power Habit #4. For every task, take one of three actions from my 3D Productivity Enhancer… then watch your "To-Do" list disappear! Trigger Your Environmental System: Power Habit #5 gives you the psychological tools to boldly break free from your two biggest blocks: RESENTMENT (emotional clutter from your past) and FEAR (emotional clutter about your future). Initiate Your Introspection System: The minute you begin connecting with your inner self, you tap into a resource responsible for your greatest ideas and most beneficial choices. Your health, career, and relationships are improved by installing my sixth Power Habit. Stimulate Your Simplify System: In my Power Habit #7, you'll learn the SIX WORDS you must read every day. Doing so will lead to what I call a Win x Win x Win result… exponential reward for all. Use Goal-Free Zones: The age-old goal-setting formula is flawed. Through my Power Habit #8, learn the four main reasons you may be STOPPING YOURSELF from reaching your goals, and the proven approach to reaching your dreams. Perform Goal-Replacement Surgery: Are you climbing a ladder that's leaning against the wrong wall? With Power Habit #9, you'll learn the three types of goals you should cut from your life. This indispensible habit accelerates achievement. Put Yourself First: Power Habit #10 starts with three simple questions that hold the power to free yourself from hidden blocks. Once free, incredible increases in income, fulfillment, and peace of mind can manifest fast. Find Your No: Throughout your life, people will try to put their goals and agendas ahead of your own. That ends the second you learn Power Habit #11. Live Your Because: Through Power Habit #12, you'll start living your true purpose in life while earning respect (and a respectable living) for the privilege of doing so. Start adding more value to everyone around you. Throughout my program, I'll also introduce you to powerful terms and strategies I've coined unlike anything you've known before. Each presents a unique perspective that will drive you to the top of the Power Habits Pyramid. I'll teach you about Success Anorexia… how you may be unintentionally STARVING yourself from achieving your dreams… and how my Power Habits nourish your mind, confidence, actions, and results. You'll learn about The Habit Loop… a subconscious 3-part continuous cycle that guarantees your bad habits today will still be with you 10 years from now. That is, until I teach you how to PERMANENTLY INTERRUPT this pattern and replace it with rewarding, productive habits. You'll learn about Win Cubed, The Belief Gap, Engaging Your Loving Mirrors, The Fog, and Treadmilling. You'll discover things such as The 98/2 Rule, The Value Gap, Positive Peer Pressure, Current Perceived Reality, Head Trash, New Desired Reality, and much more. Thousands of people around the world live by these terms and my Power Habits every day. As a result, they are checking off lifelong goals that are on their bucket lists… one after another! Now it's YOUR turn! If you're ready to take your foot off the brake and replace destructive habits that halt your progress with winning Power Habits, please allow me to send you my Nightingale-Conant program The Power Habits System: The New Science for Making Success Automatic. 10 audio sessions on 7 CDs: Through these 10 sessions, you will quickly and effectively move up the Power Habits Pyramid, replacing your unproductive habits with productive Power Habits with every step. When you reach the top, you are no longer holding yourself back from creating the abundant and fulfilling lifestyle you want. The Power Habits Action Guide Writable PDF Workbook: The perfect supplement to the audio sessions, your Power Habits Action Guide is where your personal journey to an exceptional life will be recorded. Here's where you'll find out more about yourself than you've ever known — findings that will help you benefit from all 12 Power Habits. 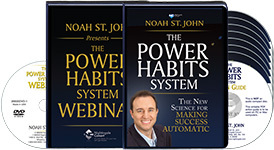 Exclusive BONUS Power Habits Webinar on DVD: What happens when you put Noah St. John in a room with several of his clients to discuss the Power Habits? You discover new insights and opportunities you can apply to your own life. We recommend watching this video FIRST when you get your program — it's that impressive. Because you are someone dedicated to improving who you are and the results you accomplish, I'll bet you have multiple books, tapes, CDs, and videos in your personal development library. I jokingly call these SHELF-help products, because that's where most of them go. Do you have a similar personal growth bookshelf? Are you looking at it right now? Then, here's your bonus: Once you walk through the 12 Power Habits, something clicks. Because you will finally have the knowledge and skills to erase that overpowering subconscious part of your mind that previously stopped your forward momentum. And by mastering this essential piece in the personal development puzzle, suddenly you are armed with the tools you need to make ALL "How-To" success programs WORK! My students are always telling me how they listened to a program they hadn't touched in years, and "finally got it!" That's your unexpected bonus. Live by the 12 Power Habits, and you'll get exponentially more results from EVERY personal development resource, new and old! More than a RISK-FREE guarantee. I'm constantly getting new programs from Nightingale-Conant. For me, it's the company's guarantee that makes purchasing a program so easy, so comforting. In the back of my mind, I always know they are ready to refund all my money fast and without any questions. I made sure they are honoring their Buy with Confidence 30-Day Money-Back Guarantee for my program... "Absolutely!" was Vic's response. So yes, you're protected. That's great. But I want even MORE for you. I'm offering my program personally to you because I know it contains the original 12 Power Habits that WILL change your life. PROMISE ONE: Even if you have read and listened to dozens of personal development books and CDs, the ideas, insights, and way of thinking you'll receive from the 12 Power Habits will be new, unique, and eye-opening. I PROMISE, my stuff is unlike anything else out there. PROMISE TWO: It simply works. Once you climb to the top of my Power Habits Pyramid and start using all 12 Power Habits, I PROMISE you'll soon be writing your own success story. It's inevitable. Work the steps, and you'll move into your new life of abundance, fulfillment, love, and joy. PROMISE THREE: I want you to reach every dream you've ever imagined for yourself and your family. But then, I want more. I believe in all sincerity that my program has the power to help change the world… but I need your help. I PROMISE that if you share the program and its message with your family, friends, colleagues… and especially people who are down on their luck, you'll play a vital role in changing our world. One ironclad guarantee... PLUS my three solemn promises to you. I hope that helps to lift any doubt or skepticism you may have had. Every story, every testimony, and everything I've written in this letter are genuine and honest, or within 30 days you can receive all your money back. I've had the pleasure of helping thousands of people "live their because." That's my final Power Habit that enables you to live every day the way you want while enjoying the best life has to offer: fulfillment, abundance, and love. But before my students took their foot off the brake and mastered the Power Habits, not one of them would have believed they were sabotaging their success and engaging in destructive habits. You may not believe it either. But I can assure you, these unconscious habits are there, holding you back from the future you want. My Power Habits will help you find them, erase them, and quickly replace them with beneficial, life-enhancing habits. Live YOUR because. Your extraordinary future is closer than you think. All of my student testimonies throughout this letter are from people just like you who could never have imagined they could achieve these results… that is, until they achieved them. Go ahead and click to order below. With our 30-day guarantee, there’s zero risk. I look forward to receiving your no-risk order, sending you this life-changing program, and hearing your Power Habits success story first-hand. YES, I want to get my foot off the brake and race to a phenomenal future. I'll get there by replacing my unconscious destructive habits with Power Habits that make reaching my goals inevitable and automatic. Please send me Noah St. John's 7-CD audio program The Power Habits System: The New Science for Making Success Automatic plus a DVD of Noah's webinar and The Power Habits Action Guide Workbook on CD today for just $119.95, which is $20 OFF the regular program price. If this program isn't life-changing, I can return it any time within 30 days for a refund or even exchange. No questions asked.